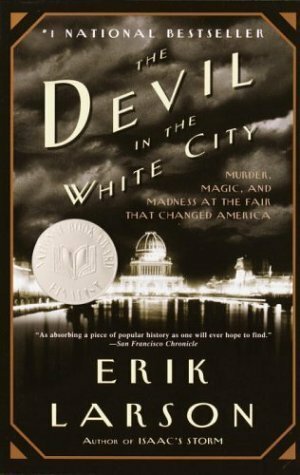 This is the second book I have read by Erik Larson, the first being his most recent Dead Wake, as well as the second book I have read for Doing Dewey’s Nonfiction Book Club. 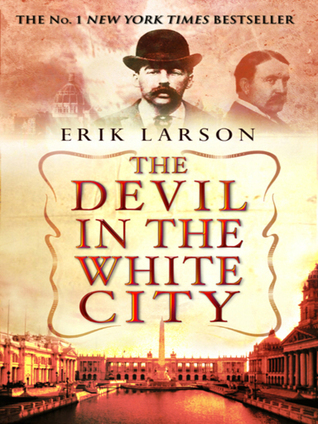 The Devil in the White City tells us two stories: 1) the conception, construction, and aftermath of the Chicago Columbian Exposition and all the people involved in making it happen, and 2) the horror of a serial killer in the midst of it all. The event attracted almost 4 million people overall (sometimes attendance was as high as 200, 000 a day, with 20, 000 people a day riding the Ferris wheel), including many notable historical figures such as Jane Addams, Buffalo Bill Cody, Harry Houdini, Scott Joplin, Woodrow Wilson, Susan B. Anthony, Teddy Roosevelt, Helen Keller, and William Stead. (Not to mention, of course, all of the great architects who worked on the Fair, such as Daniel Burnham, Frederick Law Olmsted, Richard Hunt, and Sophia Hayden.) Mark Twain did not attend. Instead, he spent his entire visit sick in his hotel room, then left without ever seeing it. Despite delays and setbacks, (financial negotiations, planning disagreements, economic instability, labour unrest, sewage problems, collapsing buildings, bad weather, health problems) the fair was thrown together in 2 years. The Ferris Wheel was invented to out-do the Eiffel Tower, which was the talk of the World’s Fair in Paris. The Ferris Wheel consisted of 100, 000 parts, 28, 416 pounds of bolts, was 264 feet high, and could hold 2,000 passengers at a time. Would you have taken a ride in it? Some of the new inventions on display at the Fair included the first moving pictures, the zipper, Aunt Jemima’s pancake mix, Shredded Wheat, Juicy Fruit gum, Cracker Jacks, and the vertical file (invented by Melvil Dewey – creator of the Dewey Decimal system). The name H.H. Holmes is just one of many of Herman Webster Mudgett’s aliases. Holmes moved to Chicago before the Fair, and constructed his own building/hotel, complete with secret chambers and vaults, gas lines, pits of acid, lime pits, and a kiln. As well as being a serial killer, Holmes was also a con artist and a bigamist. He was able to charm his way into several marriages, and out of paying his creditors. It wasn’t until a couple of years after the Chicago World’s Fair that Holmes was finally taken into custody for fraud. In the end, he confessed to 27 murders, but it is thought that the number may actually be over 200. Daniel Burnham was an amazing guy when you think about it. Besides his architectural accomplishments, he was able to pull this event together, despite all the setbacks, in an incredibly short amount of time while holding onto his health and his sanity. I think it would be interesting to learn more about his wife, and some of the other women behind the scenes. I liked reading the excerpts from the letters he sent to her while working away from home. Margaret and Daniel Burnham had 5 children, and Margaret outlived him by 30+ years, living into her late 90s. There is so much information packed into this book, so many facts and incidentals, that help make the book even more interesting to read. However, at times there was so much that it felt overwhelming. It helps to be wide awake when reading this book. In the Epilogue, Larson talks about what happened to some of the notable people who had been involved in the Fair, which was a satisfying way to end the book. He also talks about the lasting impact the Fair had on America, one being the idea that cities can be beautiful. I did a lot of googling while reading this book. To me every trip to a library or archive is like a small detective story. There are always little moments on such trips when the past flares to life, like a match in the darkness. What was your favourite part about this book? What do you think Erik Larson should write about next? This is the book that made me realize nonfiction can be fun and interesting, so it’s a favorite. I felt like I could absolutely conquer Jeopardy after reading it – so much information! This is my favorite of Larson’s books. I’m glad you finally got to read it! And appropriate for this week, too! Yes, you’re right! You can’t get much creepier than real life serial killers. Another good one by him is Thunderstruck, which is about Marconi and the murderer Crippen. I also have the Garden of Beasts on my shelf. That one is good, too. This sounds like a great Halloween read, as Kay said. I think I first heard of it when Emily reviewed it, and after reading Dead Wake, I’d definitely like to read more of his work. Thank you for the review! Love that list of inventions at the Fair. The inventions and the notable visitors were probably my favourite part of the book. The part about Holmes was fascinating, but not as amazing and interesting as the other parts. It was interesting following Detective Geyer around, though, as he tried to figure out where Holmes went next, and what had happened to the children who had been in his care. I love Erik Larson’s quote about libraries. That is how I feel as well. There’s always surprises. I just had to share it. I love finding ‘treasures’ in the notes and acknowledgments sections. It is so thorough! Be prepared to be inundated with facts! I would love to see the movie just to see what the White City looked like. I’m glad I know that going in, maybe I won’t be as overwhelmed! Thanks! In the Garden of Beasts is still my favourite but this one was my first Larson and it will always have a special place in my heart! Larson is such an amazing storyteller. It’s not easy to do what he does. I agree with you that at times this one was overwhelming though – he elected to tell two MASSIVE stories! I love this book! I think about it often when I’m think about what a beautiful city I live in. I really need to read Dead Wake and In the Garden of Beasts! When I was reading your library post today, I noticed that you live in Chicago, and I thought for the first time in my life what a city rich in history it must be. I never knew that or thought about it before. Getting museum passes at the library is very cool. Dead Wake is so good! I’ll definitely be giving this a go – it sounds so interesting! I haven’t read anything by Erik Larson but some googling has shown me that I should pick up some of his books. ‘Dead Wake’ looks pretty great. I saw the bell of the Lusitania at a WWI exhibition earlier this year and learnt a bit about the sinking of the ship, so I’ve pretty interested in that event since then. Thanks for bringing him to my attention! I loved both this one and Dead Wake, but have heard that all his books are good. If you are interested in the Lusitania, though, then that might be a good place to start. I think it’s still my favourite. Well if you liked it, it must be good 🙂 I’ll definitely be checking it out. I hope you get a chance to try one soon! Are you participating in Nonfiction November? I love all the fun facts you share from this book! They were one of my favorite parts. It made me want to do a lot of googling and sharing fun facts with other people too 🙂 Thanks for joining in for another great read-along! I truly spent half my time googling – I wanted to know more about everyone I was reading about, including what they looked like. It’s interesting to see who is more well known or written about (for example, the wives were almost impossible to find information on). I love when a book makes you want to find out more about a topic. Going to add this to the reading list!